Mankind has always endeavored to create sound – either naturally or artificially. The earliest attempts were by hollow logs, sticks, stones, blowing through reeds. Later came the percussive types with animal skins stretched over open vessels and shaped metallic gongs during the Bronze Age. The first successful attempt to record and replay sounds was Thomas Edison’s phonograph in 1877. All LPs and CDs trace their lineage to this man. Space prohibits me from a complete chronology from intervening years. When electricity became a normal fact of life in the early 1900’s, technology then paved the way for instruments beyond the traditional orchestral sounds of Strings, Brass, Woodwind, and Percussion. During the 1920’s Leon Theremin developed an instrument which, to this day, is associated with the eerie sounds of early sci-fi/horror pictures. In the 60’s the Beach Boys used it on their hit “Good Vibrations.” The instrument was played by moving hands near, but not touching, a metallic rod or plate. The next milestone was the invention of the tone wheel by Laurens Hammond, 1935. This sound generator led to the Hammond B-3 organ, which was the mainstay of professional musicians for 50 years. Other similar approaches were the Wurlitzer electric piano, and Fender Rhodes piano. B-3s are as collectible as Harley Davidson Motorcycles. The Mellotron wouldn’t even exist if it weren’t for the next step in recording technology. The cylinders and discs of wax/phonolic records couldn’t be recorded; that is, they were playback-only. In the late 1940’s the AMPEX tape was developed by Alexander M Poniatoff, with backing from Bing Crosby. At last, a medium existed that could record, playback, and re-record, as well, it could be erased, cut and spliced. A whole new world of possibilities was ready for the musician and for visionary engineers. In 1952, harry Chamberlin of Upland, California manufactured units that contained recorded loops of various rhythms. Eventually he would have a design that played a taped sound when a key was depressed, then return to the start of the tape when released. Musical instruments were recorded, the sounds lasted for 8 seconds, and then the tapes were arranged in keyboard fashion usually with 35 keys. Two of three sounds or voices were recorded on 3/8″ or 1/2″ tape side-by-side. The selection of sounds was made possible by shifting the tape heads side-to-side. Sometimes, the tapes additionally had six banks of sounds recorded end-to-end. These were available via a selector button. Mr. Chamberlin had produced many versions of this instrument, the crowning touch was one model with four keyboards and a set of bass pedals. It resembled a mighty theatre organ. The Chamberlin was being produced in small numbers, and the salesman, Bill Fransen, went to England to find a source of 70 matched replay heads. This request intrigued the Bradley brothers (Les, Frank & Norman) of Birmingham, who were producing Spitfire parts, tape heads, and other items. Bill went to England in 1962 with 1 or 2 Chamberlins, and the Bradleys decided they could improve its design into a commercially viable instrument. At the end of that year, the prototypes of the “Franson” were produced. I cannot account for the spelling change; however, the name wasn’t used. After some thought, the final choice was “Mellotron” for Melody Electronics. The first unit produced was the Mellotron Mark-I, an elegant piece of cabinetry, with red mahogany veneer and a highly polished finish. Approximately 55 were produced from 1962-63. Even the selector buttons had a mother-of-pearl appearance. Design improvements yielded the Mark-II, which was produced from 1964-67. About 250 were made: almost all Mark-I’s were upgraded to Mark-II specs. It was during this era that Mike Pinder entered the Mellotron picture, and worked at the factory for 18 months. Les Bradley had been Mike’s employer, and Mike himself had some innovative ideas. The Bradley’s were wonderful people to work for. A warm friendly atmosphere prevailed throughout the small factory. I will never forget seeing and playing the Mark II for the first time. This was my “first man on the moon” event. I knew that my life had led up to this moment, this portent to the future, and the instrument felt like an old friend. I spent a few days in every department of manufacturing. This gave me a good overall knowledge and feel for the instrument. My position was quality control and test driver. I made suggestions as they occurred to me, and “I passed no ‘tron before its time.” Later, after I had left Streetly Electronics to found the Moody Blues, I finally got a Mark II Mellotron that Les Bradley had located for me. It was at the Dunlop Tyre Factory’s recreation centre (where no one knew how to use it). Finally I was able to experiment freely. 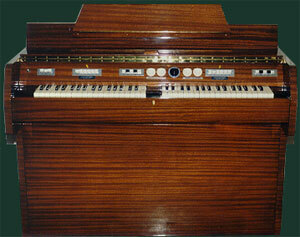 The instrument had 2 keyboards, 35 keys each side, with a control-panel above. The left-hand keyboard had rhythms and fill sounds, while the right-hand keyboard, had lead instrument sounds. Three sounds were available from each key, and also a selector switch enabled one of 6 banks, or stations, to provide additional sounds. Thanks to Mike’s knowledge of the instrument, and musical ability, the Moody Blues’ success was due largely to the Mellotron. This instrument was also embraced by the Beatles “Strawberry Fields Forever”, the Rolling Stones “200 Light-Years From Home.” In all, over 1,000 albums would feature the Mellotron sound, from artists worldwide. You can see the Mark-II being played by Mike on the rear of the LP In Search Of The Lost Chord. I was able to spot the fact that Mike had reversed the top cover on the unit. The first modification I made was to replace the rhythm and fill tapes with a second set of lead tapes. This gave me 36 choices to mix sounds. Plus, I didn’t want to play someone else’s music. I only wanted to play someone else’s instruments. Secondly I removed the heavy fane speakers. I didn’t want to lug them around, and I immediately took a line-out feed to a stage amp/speaker system. The third modification involved replacing the valve/tube pre-amplifier with a transistor system and I was able to get hold of some of the first printed circuit DC motors. I replaced the trouble-making AC motors. This solved the problem of the ‘tron going out of tune when all the Mrs. Smith’s down the street from wherever we were playing turned on their electric stove/ovens and created a drain on the electric supply in the area. On several occasions it was necessary to send my ‘tron back to the mellotron factory for mechanical adjustments, etc. Often my modifications would show up as revisions in the new ‘trons. I always regarded this as a compliment. Mike, with his Mellotron, had woven beautiful and ethereal tunes throughout the Moody Blues’ albums. So much so, it captivated me (Jerry) at age 13. Upon identifying this instrument, I had Mike Pinder as a role model in my life. Great anticipation preceded each new LP release, and I resolved someday to see a real Mellotron. But this is only the beginning. It was also used on the later LP Seventh Sojourn. In fact, if you have your vinyl copy, you can see Mike playing the M-300 (inside photo on the liner jacket). This unit is rare, only 55 were produced. Speaking of Mellotron Flutes, I got to know John, Paul, George and Ringo over the years and I introduced them to the ‘tron. They all said, “Hullo-wer vury pleased tuh meet yuh!” Within a week all four of them had a Fab-Tron. I knew that I would be rewarded, and the first time I heard “Strawberry Fields,” I was in bliss. It was the closest thing to recording with them, other than my visits to Abbey Road during their recording sessions. I did get to breathe on Magical Mystery Tour, though, I was only six feet away from the vocal mike during “Roll Up! Roll Up!” Later on I played electric guitar with John at his home as we worked together on some of his material prior to he Imagine sessions. I was going to play mellotron on one of the sessions; however, the tapes in John’s ‘tron looked like a bowl of spaghetti. It was a hopeless mess. So, I grabbed a tambourine instead and played my socks off on “I Don’t Want to be a Soldier Momma,” the last track on the Imagine album. I was always happy that the guys bought ‘trons and I’ll always be proud of my small part in influencing the greatest band in the world. Beginning in 1972, the mellotron was sold in the U.S., and that’s when I made my first contact. I had quickly made friends at Dallas Arbiter, New Jersey, and that year, met Mike Pinder in New York City during the band’s Seventh Sojourn tour. Upon hearing his 15-minute version of “Voyage” on the Mellotron, I set about to own one of these instruments. The next model to be produced was the M-400, which rocketed the Bradleys to success. This was the most portable, dependable Mellotron made to date. It was a single 35-note keyboard, housed in a white cabinet. These were produced from 1970-1986. In all, about 1850 were manufactured in Streetly, Birmingham. It had one bank of three sounds (no rhythms or fills now), but the tape frame could be easily changed in “3 minutes.” Previous models had problems with tapes binding, or breaking, as well as with operational stability. The model 400 was my first Mellotron, which I purchased new in 1973, when I was 19. The Mellotron/Novatron had rough times in the late 60’s and early 70’s when the Musician’s Union tried to block use of the instrument. Mike was a staunch defender of the Mellotron and appeared in public and on TV in support of the Bradley’s instrument. Some time later, the Moog/ARP synthesizers were gaining popularity. Mike used the Moog extensively on his song “Melancholy Man” and on the intro to the album Every Good Boy Deserves Favour. After their world tour ended in March 1974, the Moody Blues went on a hiatus that lasted about 4 years. The Mellotron Mark-V, made in 1975, was used by Mike Pinder on his solo debut, The Promise. The Mark-V, was , in essence, two M-400’s put together — with added reverb and stereo/pan outputs. Its cabinet was covered in wrinkled black vinyl. This model was very popular with John Lennon. Only 28 were made. I demonstrated to the unions how I was using the ‘tron with lead sounds on both keyboards and no rhythm or fills. This broke their argument that I, and others, would be putting musicians out of work. I had also visited with Harry Chamberlin and purchased a couple of his machines which had a superior method of tape-return. Finally, the model 400 came along with its tape-cassette. I did not use this model, though. It was too small for my stage needs, and I felt that the sound quality was not acceptable. However it was the break the Bradleys had been waiting for. I suggested placing two cassettes in a MK2 size cabinet and voila! the MK5 The Pindertron was born complete with Transistor pre-amps, DC motors, stereo-line-out jacks, earphone-jack plus the top of the cabinet was flat — just like the MK2s I had flipped the lids on — and no loudspeakers to boot! Mike’s final note…..My MK2s were dispersed among many budding Mellotronists — including The Beach Boys. The MK300 disappeared I know not where. I lost one of the MK5s in the Malibu fire of 1983 up at my Indigo Ranch, and the other one I later relinquished along with all of my spare parts to Dave Kean for his collection. The MK5 was the closest to my own personal vision of a mechanical ‘tron. I spent many a day in love with my ‘trons…but it was the soul/sound within the machines that I loved!! In 1976 I held a 256K Digital memory chip in my hand and I saw the future….again. I still play the Mellotron, and when I do it never breaks down because I have all of the sounds stored in my digital Samplers. I would have given almost anything to have this equipment when I needed it, and there were plenty of times it would have saved the day….remember? So friends, the Mellotron has made its mark in musical history. Streetly Electronics, unable to compete with synthesizers in the 80’s, closed its doors in 1986. But the story is not over yet. the cause to restore these has been heralded by David Kean of California. He purchased remaining parts/recordings in 1989. Similarly, in the UK, John Bradley is doing his share with partner Martin Smith to keep these instruments alive. And, there are many devoted collectors like me who are preserving the Mellotron for future generations. The Mellotron for me, has been deeply personal. My career and direction, musical tastes, success, etc., are due directly to the Mellotron and the magic of Mike Pinder. This inspiration began 30 years ago and will continue, From 1973 to 1982 I knew people who sold the instrument. How privileged I was to play the first retail MK-V stateside in 1975, and the prototype 4-Track model in 1981. I played with a local band in the 1970s, and the Mellotron actually put me through college. I courted my wife with the Mellotron providing atmosphere. We celebrated our 20th anniversary in UK this summer with the Bradley family, who showed us the city of Birmingham, the former Streetly factory, and the residence of one of Mike’s sisters! To honor the music of Moody Blues/Mike Pinder, I am now restoring my four Mellotrons to like-new condition. One will be a custom model, in memory of Les Bradley, who, sadly passed away last year. My original M-400 has gracefully aged with me these 24 years, and has a special place in my heart. One of these days, I’ll own my own Mark-II, and complete the circle begun long ago. I’m proud to call myself a “Mellotronist” to devote time/love to restore/play them to tolerate their personalities, and willing to live 8 seconds at a time. Thanks to David Kean who single-handedly rescued the Mellotron from oblivion and provided insights to the Mellotron story. Thanks to John Bradley/Martin Smith and their families for sharing personal anecdotes/material with me, and for their labor of love to preserve the Mellotron. Mark Vail’s book “Vintage Synthesizers,” an excellent source of information, on many important keyboards, the people, and their history. Merci Beaucoup, Monsieur Pierre Veilleux, mon ami, pour les Mellotron photos. Thanks again to Brian Dunn who has written the original version of this document, in full-length form, so completely, and meticulously. Mike Pinder for the music/inspiration given to millions worldwide, his insights and anecdotes from a musical era, and the gift to span the generations. I came across this new instrument, and thought about you, that you might want to check it out. Have an extremely great evening. By some chance, did your Mkii have the piano bank in it during the 60s? Every time that I listen to Days of Future Past (Tuesday Afternoon and Evening Time to Get Away), the piano parts sound so robotic. Especially during the “I’m looking at myself…” Section of Tuesday, the “F” on the piano has the same clanking sound every time it’s it. It really made me wonder if the Mkii was used. Hello Mike. How great it is to be able to actually write to a childhood idol to thank you for the enormous joy you have given us over the years. I had just started high school when my older brother bought “On The Threshold Of a Dream” and your songs “Have You Heard” and “The Voyage” honestly changed my life. I am no musician but I became a huge fan, bought everything, and became utterly fascinated with electronic music technology. The very first concert I ever attended was The Moody Blues at The Forum, in Inglewood -still have the ticket stub ($6.50) In any case, I’m just one of thousands whose lives were improved by your art through the unique sound you pioneered. Thank You. Mike – Congratulations on your induction into the Rock & Roll Hall Of Fame! I have always been puzzled by the lag. I played keyboards from 1966 to 1987 in several bands in Baltimore and believe I was one of the first musician in Maryland to own a Mellotron which I purchased from Yeager’s Music Store in Highlandtown, Maryland around 1971. I also had a Hammond B-3 and Leslie along with a Rhodes 88. I really enjoyed the article under your Mellotron tab. I was listening to your music on a real-to-reel breaking down the Mellotron parts in the late 60’s and early 70’s. My Mellotron was always out of tune which drove me and the rest of the band crazy. However, when it was working correctly it was fantastic. When disco came out in 1975 the rock band dissolved and I sold the Mellotron to an accordian player! Wish I still had that and the B-3. Much success and keep on doing what you do so well.